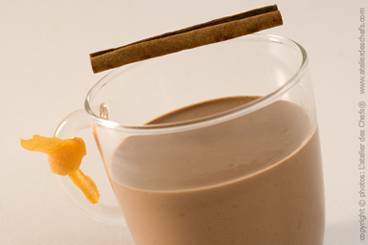 A simple hot chocolate made with dark chocolate, cinnamon and orange. Wash and peel the orange. Place the water in a saucepan and add the cinnamon sticks and the orange peel. Bring to the boil and simmer for 4 minutes. Bring the milk and the cream to the boil and then add the cinnamon and orange infusion. Break the chocolate into pieces and place in heatproof bowl. Pour the mixture through a sieve and on to the chocolate. Stir until the chocolate has melted and then pour into cups to serve.